How can new PayPal Country be added in Pro Sites? I don't see any option to select country as "Greece" in PayPal Site section inside the Pro Sites PayPal Payment Gateway section. How can I add Greece? I hope you're well today and thank you for your question! The issue has been passed to our developers and they are already looking into it. Please keep an eye on this ticket and we'll update you here as soon as we got additional information or a plugin patch for you. Always make sure to keep a backup of your site before changing/adding custom code. 1] Navigate to your /plugins/pro-sites/pro-sites-files/gateways/ directory. 2] You will find a file named gateway-paypal-express-pro.php, rename it to gateway-paypal-express-pro-backup.php to keep the original as a backup. 3] Download the attached .zip and extract it. You will find a new file named gateway-paypal-express-pro.php as well. 4] Upload the file from the .zip into the "gateways" directory on your server. 5] Everything should work after that automatically. This will be included on an upcoming release as well of the plugin so there shouldn't be any need to re-apply this patch. Tell me if you need further help with this! Hello there. i would really need Greece to be included also in MarketPress for paypal express gateway. p.s please can you also enable in paypal express (which is also the main checkout gateway for Pro Site) to accept credit card without the need for the customer to have paypal account? I just talked to Konstantinos and he'll look into it but he'd appreciate a bit of patience. He'll check things out and get back to you here as soon as possible. In addition, also if possible in Pro sites payment gateway, could it be possible to apply a way for the customer to checkout via paypal checkout procedure but without the need to own a paypal account?i think there is the possibility to just enter credit card credentials without the need to have a paypal account. This could complete the checkout procedure for the customers,because not everyone has a paypal account or is even willing to create one, at checkout.Just credit card and/or paypal account, via paypal would be much appreciated. 1] Navigate to your plugins\marketpress\includes\common\payment-gateways directory. 2] You will find a file named paypal-express.php, rename it to paypal-express-backup.php to keep the original as a backup. 3] Download the attached .zip and extract it. You will find a new file named paypal-express.php as well. 4] Upload the file from the .zip into the "payment-gateways" directory on your server. This will be included as well on an upcoming MarketPress release. As for the payment without login could you please see this documentation from PayPal and tell me if you have the option enabled? https://developer.paypal.com/docs/integration/direct/payments/guest-payments/ . If you do have the option enabled as PayPal mentions and it still doesn't show up please tell me so I can take a look if we're missing something from our end. Also on a note as far as I know that option is available on Premium & Business PayPal accounts only. hello, first of all thanks for the patch! i do have a business account. Thank you nick for the information & screenshot. I'll forward this to our Developers then so they can take a look. Unfortunately I can't have an ETA to give you at the moment as I'm not really sure what changes that would require. We'll keep you updated as soon as there are any news. If you have recurring subscriptions or if trial is enabled then the PayPal process uses the subscription mode. If you see on the image you've sent me from the options it states that the "no login" form will not work for subscriptions. Only for single-time payments. Could this be the case with your setup? Do inform me so I can update our developers as well if this needs further investigation. Best of all, this upgrade requires no action on your part. The checkout automatically applies to Website Payment tools like Buy Now Buttons, Donations, and PayPal Shopping Cart, as well as our Request Money and PayPal Invoicing features. Customers enter their name and shipping address. They’re prompted for their credit card, email address, and phone number. (Optional) After reviewing their information, they may choose to save their information by creating a PayPal account to make future transactions faster. Please note that PayPal’s fraud prevention measures remain in effect for buyers who use this checkout. PayPal applies the same techniques for this checkout as it does for other transactions. To turn the feature off, simply go to the Profile subtab, click on Website Payment Preferences under the Selling Preferences column, and check the yes/no box under PayPal Account Optional. *This feature is available to Premier and Business account holders only." Then you said "If you have recurring subscriptions or if trial is enabled then the PayPal process uses the subscription mode. If you see on the image you've sent me from the options it states that the "no login" form will not work for subscriptions. Only for single-time payments." So i need to set this to no? i don't understand! i have recurring payment + trial. SOOOO do i have to dissable it or is there something else to be done from your side? Sorry nick I got a bit confused on your reply. I'm attaching the image you shared to me from the account settings so I can explain again. If you have set up Pro Sites as a "recurring" payment or if you have Trial enabled, that counts as a subscription. According to what the PayPal settings mention the "PayPal account Optional" won't work because of that. Unfortunately I can't tell you what to do with your payments as that depends on what you want to offer to your clients, so changing the the way you want to receive payments to enable a faster checkout is totally up to you. "If you have set up Pro Sites as a "recurring" payment or if you have Trial enabled". yes it is a recurrring payment, by default i think,correct?and i do have trial. i could remove the trial though, if that could solve the issue. Isn't there a hack from your side, in order to achieve the direct credit card (bypass the process) and/or paypal account? or , what else do i have to set up alternatevelly in order to achieve my goal? PayPal Express Checkout is the availabe PayPal payment option in Pro Sites, which doesn't support accepting payments without login to a PayPal account. 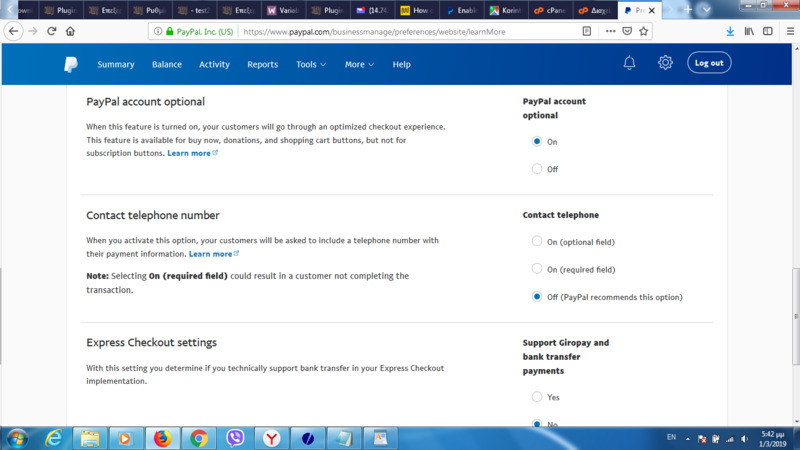 As you can read here, to start accepting recurring payments from customers without a PayPal account, you should use PayPal Website Payments Pro, which is not available in Pro Sites now. ok, i hope you realise though, that paypal express checkout is a customer pusher away. hi again,you said"you should use PayPal Website Payments Pro, which is not available in Pro Sites now." And in that case, you would be right: Greece would likely need to be added as a country option in that custom gateway as well "
i read in https://developer.paypal.com/docs/classic/products/paypal-payments-pro/#documentation that Currently, PayPal Payments Pro is available in the US, UK, and Canada. " Anyway, i searched for a developer to do the job and they said that they could do it. But officially i would like you to inform me if it would actually work for my case, keeping in mind all of the above regarding that the PayPal Payments Pro is not yet available in Greece. I ean the developer could make integration between the two plugins...but will it work anyway for me in Greece...or not? Is there a meaning of hiring the developer or not? Unfortunately, No. If Greece is not in the list of supported countries by PayPal Payments Pro, simply adding Greece within our custom gateway will not work. We don't think there is any workaround available for this. So we will have to wait for PayPal to add more countries to the supported list, or get an account in supported countries. You may contact PayPal support to get more details about this feature.